The woman’s dress on the newspaper advertising matches the upholstery on the chair the man is sitting in perfectly. Plus the ad tagline: ‘LOOKS ARE EVERYTHING’ combined with the woman’s dress, turns this workaday image into something much more surreal. 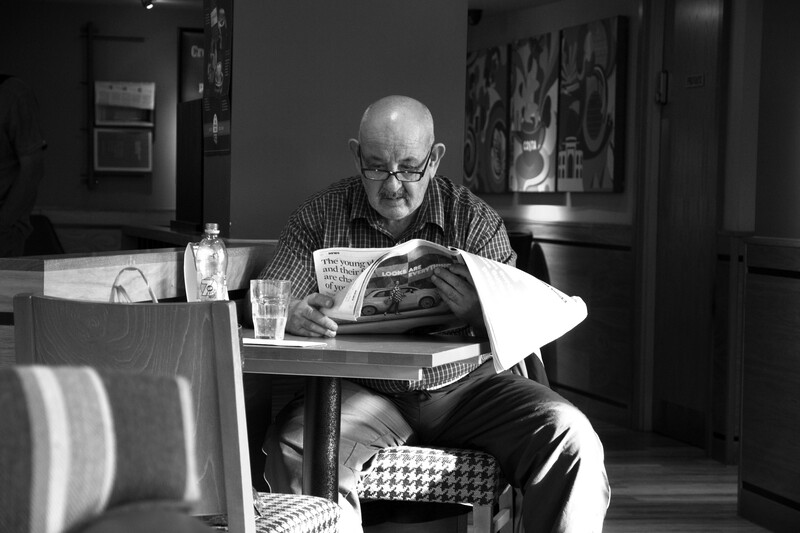 The man looks so engrossed in his paper, seemingly unaware of you Chris taking the photograph. Then the black and white takes the image to it’s final artistic conclusion. Well, then you must have a copy of this too darling girl! Thank you for your lovely words, your ability to look into the photo and see -that’s the artist in you. Chris- you are one of the most dear sweet people I’ve ever met! I’ll enjoy this image on your blog, as I enjoy all your work. I’m just grateful you share it here. Chris, this one is crazy! I followed Pam’s eye in amazement. How did she see that little tiny woman? And then I realized I really need to enlarge your photos more often to catch the detail. I agree with Pam here. Incredible! I’m just brilliant me! What did we do before we had iPads etc and could enlarge the images to a size to suit our ageing eyes? But Pam does have an incredible eye (and ear) hence her excellent comic strip. Thank you for your enthusiasm. Hugs Chris. J.H…. I saw the words LOOKS ARE EVERYTHING and knew I had to click to see better. Chris always uploads a large file- (thank you Chris!). It’d be cool if I could see that small stuff… but alas, glasses are now my constant companion. It is an amazing image- so layered.